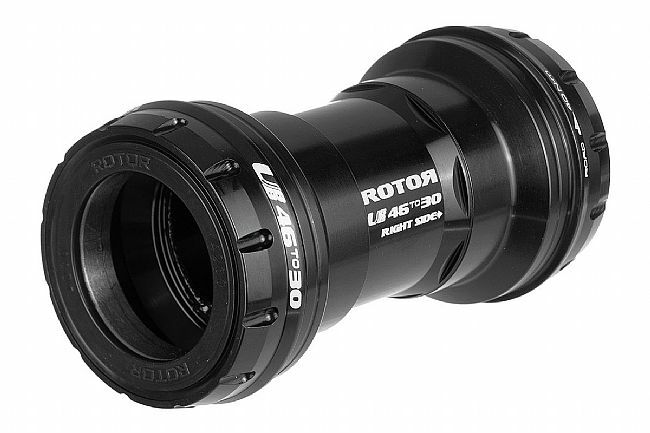 The Rotor UBB4630 Bottom Bracket is designed for universal compatibility with 46mm diameter bottom bracket shells. Crafted from 7000 series aluminum alloy, the UBB4630 uses a threaded sleeve to lock both cups in place – without having all the locking effort rely on the press fit shell, thus providing a uniform spin and avoiding undesired noises. The flush fitting in the press fit region prevents bearing overload and also improves bearing alignment for a longer bearing life. The external bearing location affords a smoother spin and increased BB shell stiffness for PF30 and BBright standards. The internal sleeve also prevents cable guides from rubbing against rotating parts. I have 2 months use with this bottom bracket on my CX bike, and it's been quite nice. Moving the bearings outboard puts them right under my pedals for mashing up big climbs. The nicest thing is that my bike is creak free now. The only negative is that the directions for installation is a lesson in minimalism. I'm running this with a SRAM Force 1x crankset. You'll need Park's BBT-79 and a BB press. Just press the non-drive side in, and then the drive side you'll screw in and torque to spec. It's quite simple really, and I've found it fixed my annoying press fit issues. Just a heads-up... If you're running Sram Force, you'll need 2, 2.5mm BB30 crankset spacers (If there is any slack, Rotor includes a little washershim, but I didn't end up needing it). Of course time will tell on durability, but so far so good.